The ILO must analyse the transformation of work from agricultural to industrial, to services and now to robotics technology, according to a submission presented to the International Labour Conference (ILC) in Geneva from 1 – June 13, 2015. This year’s ILC discussed three main topics, namely the transition from the informal to the formal economy, SMEs and decent and sustainable employment and the third is the labour protection policy, which includes wages, maternity policy, working hours and occupational health and safety. The IYCW delegation actively expressed their political views in all committees. In the informal economic committee and social protection, IYCW highlights some important issues, among others, urged adopted the concept of a living wage for all sectors of work and social protection should be inclusive apply to all types of workers and universally applicable. Responding to ILO Director-General report on The Future of Work Centenary Initiative, Andy Predicala, International Treasurer of IYCW expressed that the centenary conversation must evaluate deeply the globalization, neo-liberalisation and free-market policy because it does not generate enough jobs but instead it creates multi-crises in the society, and does not warrant fair distribution of wealth. It must also analyse the transformation of work from agricultural to industrial, to services and now to the robotics technology. The IYCW also urged that social protection coverage must be extended to all workers in the informal sector and all informal workers should be entitled to enjoy all basic rights of workers. IYCW President, Ludovicus Mardiyono, added that labour protection is a global issue and requires a shared responsibility. 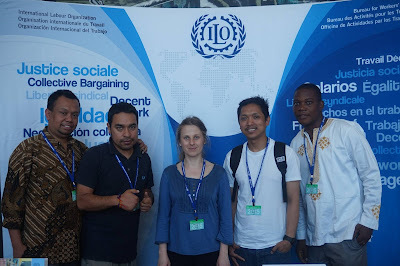 “We propose to the ILO to take the political steps to agree upon and immediately sign the ILO Declaration on Universal Labour Protection, and this declaration should be inclusive and universal,” said Ludovicus from Indonesia. “IYCW along with other Catholic organizations and trade unions continue to voice social justice and peace for all workers in the world,” he concluded.